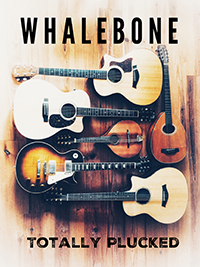 Whalebone’s Totally Plucked tour features high energy acoustic music alongside haunting atmospheric tunes, played on guitars, baritone guitars, bouzouki and mandolin by duo Steve Downs and Char Watson. The show includes material from their latest album 'Mirabilia', inventive interpretations of traditional music, rock classics and original material from their award-winning albums along with tall tales, folklore and myths which inspired the music. This will be a rare chance to see Whalebone perform an all-guitar show, due to the temporary unavailability of fiddler Sarah. With artistic sensitivity always at the fore coupled with their charismatic rapport at live shows Whalebone promise a feast of 6 and 8 string fireworks!